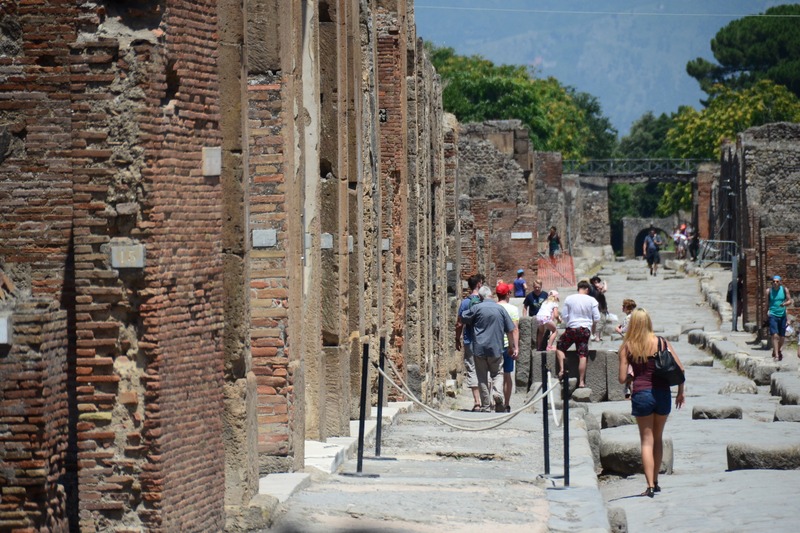 In 7th century BC, 2700 years ago a city developed fastly at Vesuvius volcano slopes. Fertile and volcanic lands between Napoli Bay and Vesuvius made the city rich with it’s location by the sea. In that day, the most luxurius thing for a man was a warm water pool. There were no water at houses and it was hard to warm considerable amounth of water. In these lands, natural warm waters of volcanic springs were rare resources. Hot baths and thermal pools was built for sailors coming back from their campaigns. In time, city becomes a fun land for rich people of Rome. 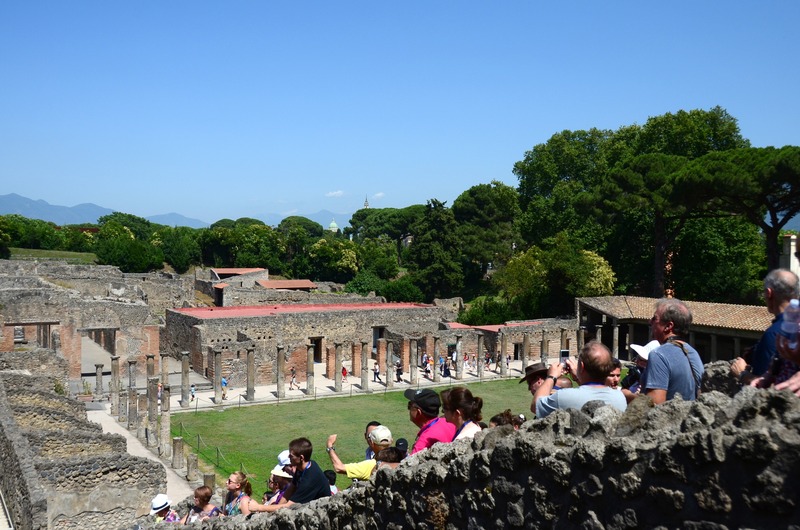 From all the Roman lands, rich people rushes with many slaves to Pompei and that makes this city capital of entertainment, luxury and glamour. 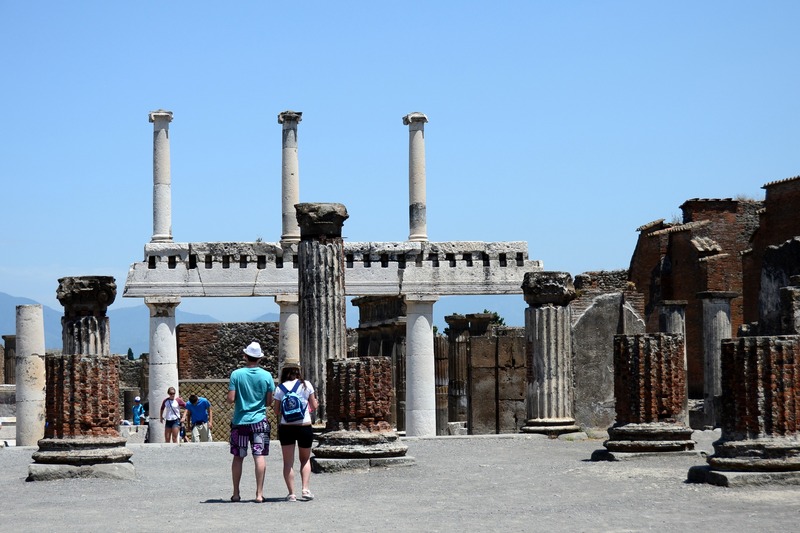 Pompei was an improved city about trading and agriculture and favorite city of Rome. 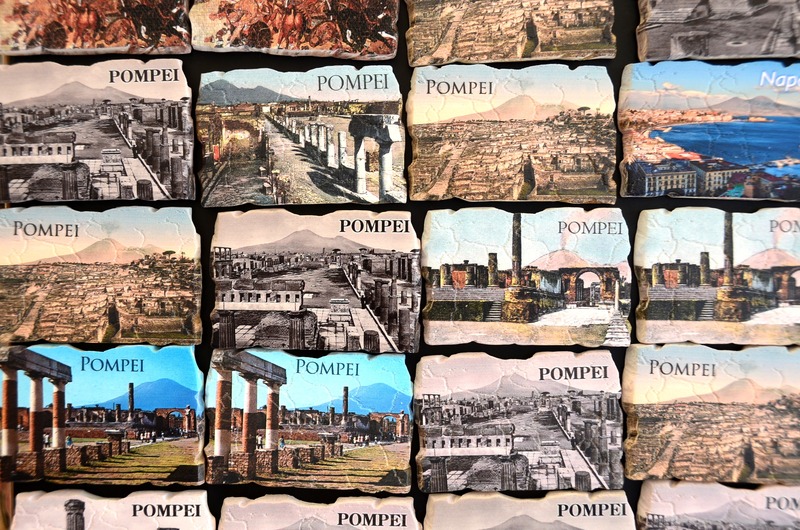 I imagine Emperor Agustus or Julius Casear saying “Let’s fo to Pompei for two weeks,” and smile. 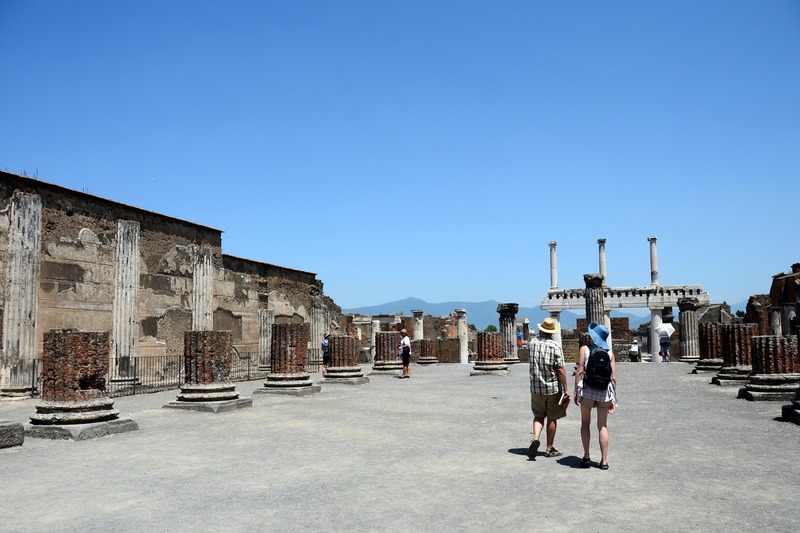 When I first read about or saw there in movies I tought Pompei was a smaller city and after a full day trip I get that it was a mistake. 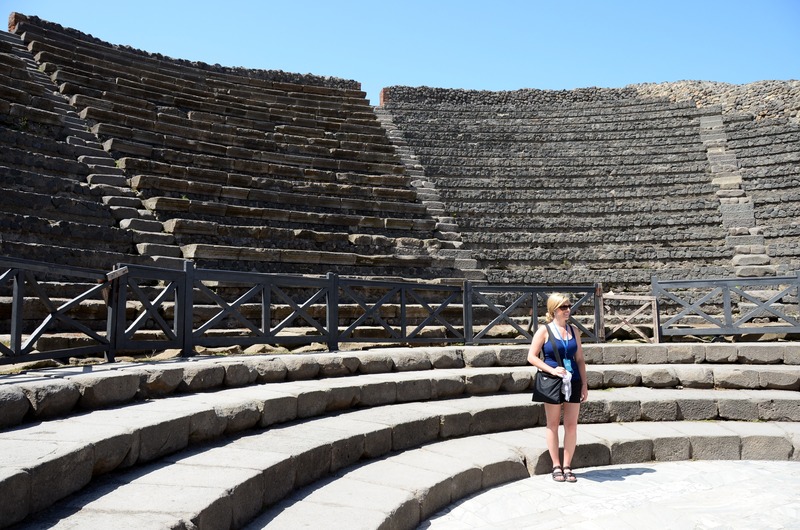 I knew so little about Pompei, the city is really big and glamorus. I’m thinking while walking in the paved, ordered roads of Pompei; time has stopped two thousand years ago and that only made this place deserted. The city stays the same. The channel carved in stone for the wheels of cars shows that intensive transporting of heavy goods into the city. There are spaces to link up horses when a car stops. Rich Roman’s houses are side by side. There are courtyards and pools in the front sides, for staying guests a couple guest rooms at the entrance. Home owners had offered a hot bath and then woman to the guests. Rooms are spacious and most of them has their own bath, everyone of them has fine stonework and mosaics inside. Entrance and exit of water calculated meticulously to avoid mold and humidity. Every house has an airy pantry, special partitions and shelfs. Wine and olive oil jar help us to visualize the life in ancient era. There is an agora on a hill at the center of the city. In that days, agora was the central square of city and buildings around it show architectural features of a wealthy nation. When we walk to down side we see coleseım. That makes us feel the reality that Romans were living within war and death. We see the taverns on stoned streets. When a traders came to city, first thing they did eat and drink wine in that places and than hit to a tavern. The oldest brothel that known in history located in here. Prostutitution was a legitimate profession in Rome, even respected. We see an ancient replica of Red Light District in Amsterdam. One of them is a two floors building which tourist are interested in. There is a long wait to get inside. A little furter, famous wealthy Roman Vato’s house. His stone relief is in the entrance. Exaggerated man genital in reliefs makes tourists laugh, may be they tell us in that day Pompei’s morals was very different from today. Forum, temples, theatres, amfitheatres, bazilicas, avenues, ateliers, urban neighborhoods, baths, taverns, laundries, mills, bakeries, casinos, brothels, inns today still exist. In the end we face the human and animal bodies who tried to escape from the poisonus gasses and smokes that wrapped the city. There is an open air museum ahead of the agora and poisoned and stoned human and animal bodies laying in ashes can be seen. Glamour and wealth was deleted from the earth, no one heard that laughters anymore. Hums of mills stopped, crops were dryed, greenery has gone and horror came to the stone streets. A dark rain swept the bright beauty of Pompei. Those stately villas, sculptures, wall paintings, mosaics, temples and markets remained about 2000 years untouched. Archeologist discovered the city and they even found last day’s bread in owens. Hot ashes that fell over Pompei was like a black snow storm for weeks. And then, Pompei silenced completely. We drink cold granite at the exit of antic city. This drink contains lemon particules, orange and crushed ice and makes us feel great in this hot day under the Mediterrian sun. I take a look from a distance one last time to Pompei. A curly girl with white cotton dress, sandals waves her hand through the fog. A farmer husband and his wife collect grapes in the old vineyards with their callous hands. I see the beautiful Roman ladies swinging in the “Red Light District”, a dog barks, a couple of traders drink wine and licentious Vato wings to beautiful ladies near by him.